Having problems with the new computer. To see the 2017 foals please click on the link to our Facebook page. Thank you. Hidden Timber Facebook. Please stop by our new page The Purpose. I've wanted to make this page for a long time and pleased I finally have it up and running. It will show you what and why we breed these fabulous little horses. 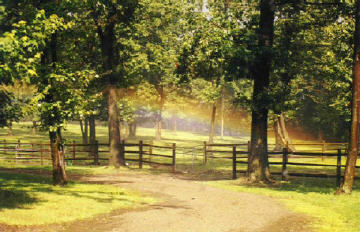 Hidden Timber Ranch miniature horses is nestled in the foothills of southwestern Pennsylvania. 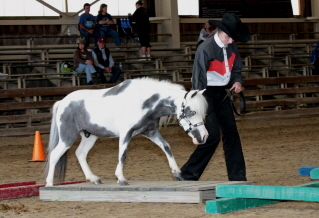 Our miniature horse breeding program is aimed at producing the finest AMHA/AMHR "A" size performance horses with color; overo, tovero and tobiano. While our goal is to raise performance horses, our horses are pretty and correct enough to win in the halter ring and have dispositions that make them perfect for pets, companions, or therapy horses. We always have a few good pinto horses for sale. Raising 6 to 10 foals per year with lots of hands on love. All of our minis have been chosen with these very important things in mind, conformation, disposition, stride and color. 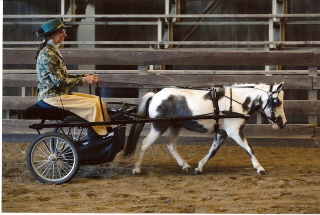 Our horses are bred to excel in performance, halter, and in giving lots of love. Go to the links below to see all of our little horses. We proudly introduce Hidden Timbers Ghostly Miracle. Ghost is a 2007 gelding sired by our T-Bone (HTR War Chief)and out of Lilliput Acres Miraculous Alex. I retained Ghostly to be my show horse when his dad retired from the show ring and to my amazement he has stepped right in where T-Bone left off without missing a beat. His first big Pinto show he came home with the award for the all around high-point mini for the show. Here are a couple of pictures from the pinto show in New England. The first picture is courtesy of Ellen Leffingwell of Photography to Remember, the driving picture was taken by Mystical Photography. Please stop by and see our new page showing T-Bones (War Chiefs) foals past and present, you can see what they are all up to these days by clicking on T-Bones foals. Lots more pictures of Ghost can be seen here also! Take your time and view our many pages, it's always nice to have guests. If you have any questions about any of the horses on this site please drop me an email. Thanks for visiting! !